Rant, Stars getting pandered to – Justice & The Media | OH! Honestly, Mariah! I don’t usually listen to star gossip or watch talk shows where guest “stars” appear, but stars have been making the news lately as they get away with more and more crap that we as “non-celebrities” would never get away with or get off so lightly for. 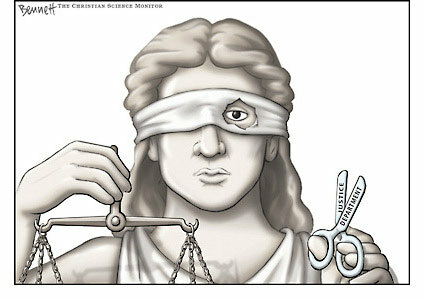 Seems to me that justice was supposed to be blind, and that is why she has a blindfold on. Well it appears that she’s gone and cut a hole in that blindfold and just like a majority of Americans, it seems, she is star struck over celebrities and treats them differently then the rest of us. Now to top it all off shows like Good Morning America are pandering to these criminals in such a way that if I had been watching their shows, I would stop immediately! Come on now, press charges! If I were there and did the same things that Chris Brown, the out of control criminal, had just done I would have charges pressed against me and be thrown in jail, and not be invited back again. What is this turning into a ratings game? I remember so many talk shows that turned into sensationalism and I stopped watching them as a result… having body guards for the guests as inevitably one guest would get up wanting to beat another guest up or hit the host over the head with a chair. America just loves drama and freaks, and if they happen to be celebrities great let them get away with anything and if we send them away it can be to a posh jail of some sort that sounds like a resort to the rest of us and only make them serve less then 1/3 the time the rest of us would do. Ok… so what started me off in this rant? I read an open letter to Good Morning America about the Chris Brown situation and I loved it, it spoke of my feelings exactly, though I am not one to swear this letter does a bunch of that and I feel it was rightfully done as it gets the point across with pin point accuracy. Here is a link to the Letter (again its full of swearing so beware of that).